SEOUL, Oct. 23 (Yonhap) — CJ CGV, South Korea’s largest cinema chain, will advance to the Russian market for the first time as a foreign theater chain. CJ CGV signed a contract Monday with Russian land developer ADG Group in Seoul to set up a joint venture in Hong Kong with registered capital amounting to US$30 million. The South Korean company will acquire a 70 percent stake. Under the contract, the two companies will run 33 theaters and 160 screens in Moscow by 2020. Russia has the world’s 14th largest cinema market, making up 1.9 percent of the world box office in 2016. Since opening its first theater outside South Korea in Shanghai in October 2006, CJ CGV has aggressively pushed an overseas expansion that has taken it into China, the United States, Vietnam, Indonesia, Myanmar and Turkey. 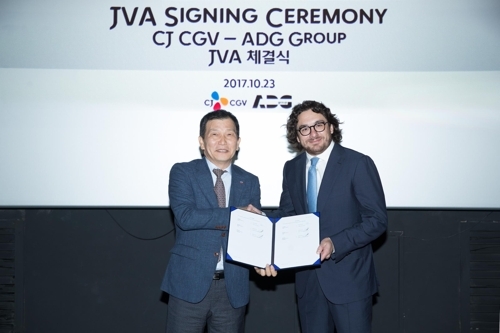 The fifth largest multiplex theater company in the world, CJ CGV aims to operate 10,000 screens worldwide by 2020.
the United States, Vietnam, Indonesia, Myanmar and Turkey. The fifth largest multiplex theater company in the world, CJ CGV aims to operate 10,000 screens worldwide by 2020.